John Ryder: How do you like "Shitsville"? Q: The woman that Jim Halsey met on the bus, why did she help him? Q: Why does Ryder place the coins on Halsey's eyes and under his tongue in the diner? Q: Would stringing Nash up between a semi-tractor & a trailer really tear her in half? A classic in my view! Starring everybody's favourite Dutchman, Rutger Hauer, this superb road movie thriller is tense, thrilling and superbly atmospheric. 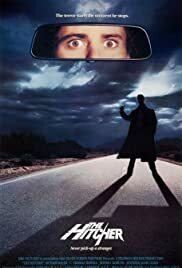 The first scene between the Hitcher and Jim Holsey was superb, Rutger puts in a chilling performance. Mr Hauer has a reputation for pulling off some memorable bad guy performances, namely this, Blade runner and Nighthawks, but this is my favourite of his performances. The lines he has were brilliant. The pacing of the film was very good and apart from Rutger stealing the show the other actors were good. Jennifer Jason Leigh was good in her small role and of course C Thomas Howell in the lead does a good job. Overall this gets a 9/10 from me.